Which course details are right for you? hold a permanent Australian humanitarian visa. Visit the Department of Home Affairs website for more information about studying in Australia on a student visa. Direct applications are due on 14 July 2019 for our next intake which starts on 22 July 2019. Apply direct to VU using our admission centre submit applications for one or more courses, track and save your progress and upload additional information. Aim for a career supporting community health, and helping athletes achieve their best. Our double degree in sport and psychological studies gives you specialised understanding of the human body and mind. The Bachelor of Sport Science (Human Movement)/Bachelor of Psychological Studies includes subjects in the biological sciences, social sciences and humanities. It prepares you for a career in the sport and exercise professions, with a focus on psychology. VU has world-class facilities, including sports labs to study biomechanics and physiology, and interaction labs for counselling practice. You’ll also benefit from extensive work experience with sporting and community organisations. With further graduate study, you can become a registered psychologist or teacher. Victoria University has been ranked number 12 in the world for sport science (Shanghai Rankings 2018). Our ground-breaking research, world-class facilities and partnerships with some of the world’s top sporting clubs have rocketed us to this position in 2018–19. Studying with us means you benefit from all of the opportunities that come with our elite status – learning from academics who are connected with top organisations, researching with national sporting bodies and accessing our cutting-edge sport-science equipment. The College of Sport & Exercise Science has a $68 million high-technology teaching and research facility at Footscray Park. Our 29 new labs are fitted with the latest technology and equipment. They are used by professional sports team and community organisations. Facilities include biomechanics, biochemistry, and exercise physiology labs, and our Altitude Hotel. Learn from expert staff, including researchers in the Institute for Health and Sport (IHES). Our research in sports science achieved ‘well above world standard’ in the Excellence in Research for Australia (ERA) assessment. We offer placement programs during your degree which give you invaluable work experience and industry contacts. You’ll complete a compulsory 70-hour placement in second year and/or a 140-hour placement in the final year of your degree. Our Career Development & Employability program is designed to help you choose your career direction, and to teach you to market yourself. We have over 200 partnerships and affiliations with peak sporting bodies, professional and community sporting clubs, and groups that focus on public health and education. Our partnerships give you the best possible opportunities and networks to advance your career. Partner organisations offer you placements and internships in Australia, and contacts within the industry to help you find a dream job on graduation. Our Sport and Recreation Industry Pathway (SARIP) program supports secondary-school students to achieve their aspirations in sport. It is available to all secondary-school students and their teachers. The SARIP program offers a sport-based curriculum supporting students’ study in the Victorian Certificate of Education (VCE). If you’re a student with a passion for sport, it gives you invaluable experience and industry links. You’ll be offered a pathway to additional qualifications, tertiary study and workplace opportunities. As part of the SARIP program, students come to VU to participate in physiology and biomechanics testing and other exciting projects. Request a call back from one of our experienced VUHQ course advisers to get your questions answered. Learn in our cutting-edge labs when you study the Bachelor of Sport Science (Human Movement) / Bachelor of Psychological Studies. With an added postgraduate qualification, you can become a registered psychologist, teacher or social worker. PE teacher (with added Masters of Teaching (Secondary), A$78,000 (Job Outlook). 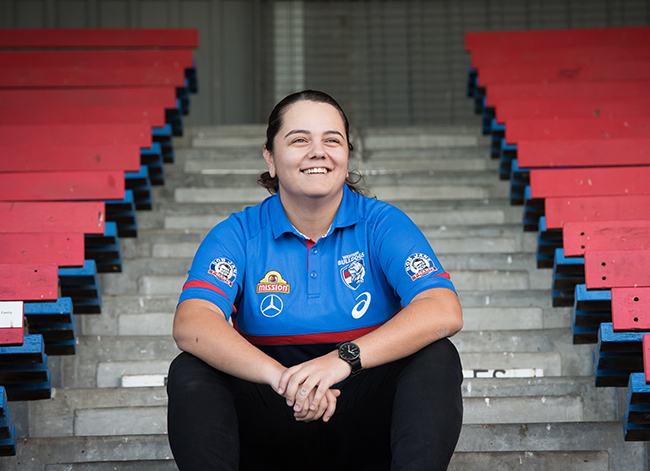 Brooke Muscat's combined degree in sport science and psychological studies has taken her to an exciting role with Western Bulldogs Community Foundation. Our Bachelor of Sport Science (Human Movement)/Bachelor of Psychological Studies is accredited by the Australian Psychological Accreditation Council (APAC). APAC conducts accreditation activities that ensure graduates receive a high-quality education and are equipped to use their psychological knowledge and skills in the community. To become a practising psychologist, you’ll need to progress to postgraduate study in psychology. 12 credit points (equivalent to 1unit) of psychological studies elective units from the list provided. 24 credit points (equivalent to 2 units) of psychological studies elective units from the list below. We've changed the way we teach our courses, so that you experience a first year like no other - focused on you and your success. From 2018, the first-year of this bachelor degree* will see units delivered one at a time, in four-week blocks. This means you won't have to juggle the deadlines and demands of studying multiple units at once. Instead you'll complete one unit before moving on to the next. All units will be conducted in small class sizes with three face-to-face sessions per week. This means you will get more one-on-one time with your teachers. laboratory and practical work (where it applies). You will have access to additional activities designed to extend and improve your skills. These activities foster the skills you need to be an adaptable, resilient, confident and competent learner and employee. Find out more about our First Year Model. 7. Contribute to the organisation and delivery of sport, exercise, and active recreation programs with personal accountability, integrity, and social responsibility for outcomes, and do it through dynamic 21st Century work-teams that use resources efficiently, provide high levels of participant satisfaction, and deliver widespread social utility. A unit or 'subject' is the actual class you'll attend in the process of completing a course. Most courses have a mixture of compulsory 'core' units that you need to take and optional elective units that you can choose to take based on your area of interest, expertise or experience. Each unit is worth a set amount of study credits based on the amount of time you study. Generally, 1 credit is equal to 1 hour of study per week. The amount you pay for your course depends on whether you’re a Commonwealth supported student or full-fee paying. Commonwealth Supported Place, your fees are partly subsidised by the Australian Government. full-fee paying place, you’ll need to pay the full amount for all units you study. Select which units you’d like to study. Look up the individual unit costs in the higher education unit of study fees list. Add up the relevant amounts. Apply for a scholarship to help with your study costs. We can help with fee assistance and advice. Use the fee calculator to get an indicator of your course and unit fees. Victoria University is committed to providing a transparent admissions process. Find out more about the University's admission requirements for all applicants, and our commitment to admissions transparency. Applicants for this course will need to have met the academic requirements and prerequisites for this course outlined below. Meeting the minimum admission criteria does not guarantee entry into this course. Past academic performance may be considered. The minimum criteria for admission varies depending on your education background. If you’re not sure which criteria applies to you, use the help tool on this page or make an enquiry and we can assist. Completion of an Australian Senior Secondary Certificate (VCE or equivalent) including Units 3 and 4: a study score of at least 25 in English (EAL) or 20 in any other English. Why is ATAR not applicable? You will not need an ATAR score to meet the admission requirements for this course. Only the successful completion of your secondary school studies, and any additional prerequisites. Our courses and support programs are designed to prepare students from diverse cultures for success, regardless of their prior experience, ATAR, age, socioeconomic or educational background. Special Entry Access Scheme (SEAS) for VTAC applicants. Special consideration for direct applicants. This information is for people who have completed an accredited award at an Australian Registered Training Organisation. Completion of an Australian Advanced Diploma or Diploma (or equivalent). Completion of the Certificate IV in Tertiary Preparation (or equivalent). This information is for people whose highest level of study since leaving secondary education is a higher education course. Full or partial completion of an Australian Higher Education award (or equivalent). Completion of two units of Higher Education studies. Completion of a bridging or enabling course eg. Foundation course or equivalent. This information is for applicants who left secondary school more than two years ago and who have not undertaken VET or higher education study since then. Five years (minimum) work/life experience in Health or Human Sciences, Training & Development, Community Sports or similar. Completion of an Australian Senior Secondary Certificate more than two years ago. Units 3 and 4: a study score of at least 25 in English (EAL) or 20 in any other English (or equivalent). Let us know which qualifications you have studied and we will help you find the admission information that most applies to you. Which of the following qualifications have you studied, or are currently studying? You will need to view information for applicants with recent secondary education (within the last 2 years). If you have completed secondary education more than 2 year ago (prior to 2017) you will need to view information for applicants with work/life experience. You will need to view information for applicants with vocational education and training (VET/TAFE) study. You will need to view information for applicants with higher education study. Still not sure? Make an enquiry and one of our advisors can assist. Take a look at a student profile to get an overview of students who have previously enrolled in this course. "<5" – the number of students is less than 5. N/A – Students not accepted in this category. There are many ways you can start your education journey at VU. Pathways offer an easy transition between courses at different levels, so that you can start with a certificate and progress right through to postgraduate study. If you have completed any of the following course(s), you will be guaranteed a place in this course. In some cases you may receive credit for your previous study, reducing the time it takes to complete your course. You will be guaranteed entry only. Find out more about pathways and credits. If you have completed study with another university or institution and believe you are eligible to receive credit for skills and past study, you can apply for advanced standing. Applications for advanced standing can be made after a discussion with your course coordinator or academic adviser. Special admission programs: Depending on your life circumstances you may be eligible for special consideration of your application. Advanced standing: If you have significant experience or studies elsewhere you may be eligible for credit for some units of your course and not have to undertake them. If you are already a VU student, apply direct to VU using our Admissions centre to transfer into this course. Remember it’s best to be accepted into your new course before withdrawing from your current one. It’s important to check for emails from us (which may go to your spam/junk folder). Please fill out the form below, and we'll get back to you shortly. Information marked with an asterisk "*" is required. At Victoria University, we aim to display accurate and complete course information online. However, we are unable to guarantee that every course change is currently displayed. You may contact the University directly on +61 3 9919 6100 to confirm the most up-to-date course fees, pathways and credit transfer, recognition of prior learning, admission and enrolment procedures, examinations and services available to our students.